This was F1's first acquaintance with a lively and powerful character taking life as it comes. In hindsight, Patrick Depailler couldn't have had a more fitting place for his F1 debut than his home GP at the dangerous mountain track near Clermont-Ferrand (now called Charade), the French equivalent to the old 'Ring. Apart from being talented and bloody fast, Depailler was in F1 for kicks. In his 8-year career he got plenty of them. In fact, his whole life was centered around taking it to the wire, much like his countryman and Ligier successor Didier Pironi. A motorcycle accident ruined his 1973 chances for Tyrrell at the two North American GPs. 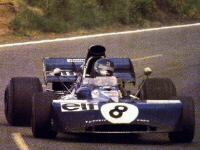 And it came as no surprise either that a hanggliding accident put paid to Depailler's 1979 championship challenge. After a brave but hopeless comeback with Alfa Romeo in 1980, a freak testing accident at Hockenheim, while trying hard to improve the cumbersome Alfa, put an end to his life. This was a sad loss to F1. Patrick is remembered best taking a smoke with a wry smile on his face while strolling through the paddock after qualifying.